Ultimate soldier. Ultimate mission. But can the SAS face the might of Rommel's army and win? In the North African desert in 1941 the war is being won by the brilliant German commander General Rommel, and the British are in retreat on all fronts. A young British army lieutenant, David Stirling, believes that the only way to reverse this situation is to attack the enemy behind their own lines, using small groups of men who can insert by land, sea or air as required. The first of these men are dropped by parachute to attack enemy airfields in the Gazala area, but the raid is a disaster, with many lives lost. The following year, the survivors of that operation, now working hand in hand with the Long Range Desert Group, mount a series of spectacular raids in heavily armed jeeps against airfields in the Benghazi region, destroying nearly a hundred enemy aircraft, leaving the German army reeling, and reversing the course of the war. 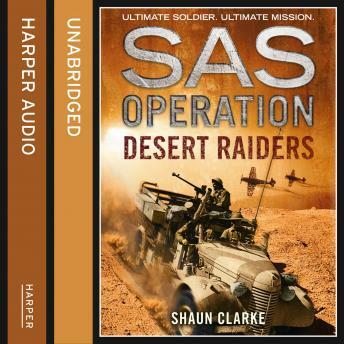 Desert Raiders is the colourful story of the birth of the SAS, the most renowned regiment in the history of the British Army - forged with fire and steel in the vast, sun-scorched plains of the North African desert, pitting themselves against the might of the formerly invincible German army, and gaining a reputation that will make them a legend in their own time.